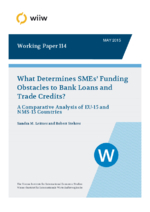 This paper analyses bank credits and trade loans as the two most important sources of external finance of firms and identifies particular firm and country characteristics that determine the ease with which both external funding sources can be accessed. It focuses on SMEs in EU Member States and uses ECB/EU SAFE microdata, which differentiate between various degrees of external funding constraints. The results show that innovators of both products and processes have a harder time raising sufficient funds from banks. Further, smaller and younger firms and firms that are part of an enterprise are more likely to face stronger obstacles from banks. Moreover, it points to the important role previous bank loan and trade credit histories plays for successful application processes and demonstrates that banks and suppliers respond asymmetrically to changes in a firm’s financial and economic situation. Finally, it points to the importance of the state and structure of a country’s banking sector for successful bank loan and trade credit application processes.